Monday – Saturday 11.00 a.m. – 8.00 p.m; Sunday & holidays 10.00 a.m. – 2.00 p.m. This exhibition continues in the vein of those held on Giandomenico Tiepolo in 2012, and 17th century Flemish and Dutch still life paintings in 2013: a small-format exhibition with few but exquisite works and a very careful installation. 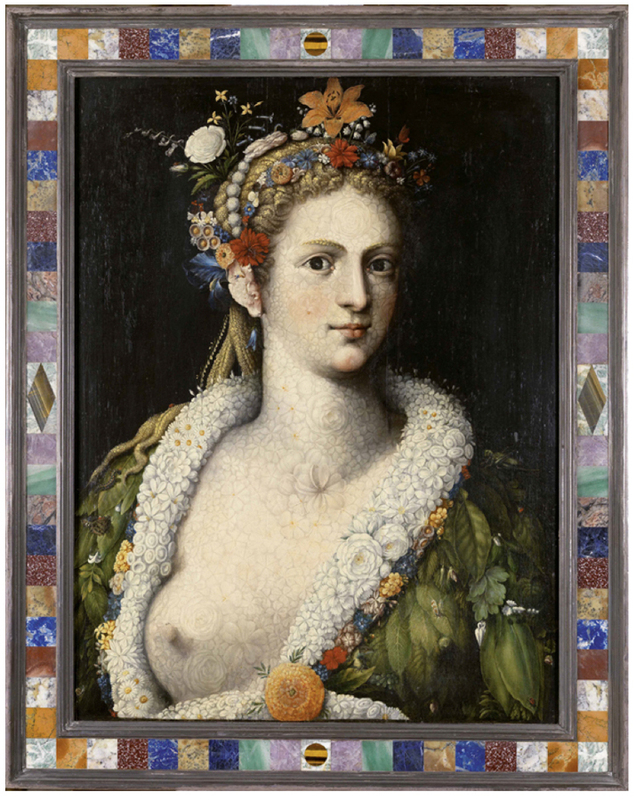 The works on show are Flora and Flora meretrix, two magnificent oils on panel painted by Giuseppe Arcimboldo (Milan, 1526-1593), one dating from 1589 and the other from around 1590, from private collections, displayed in public for the first time. They are two examples of the so-called teste composte, or ‘composite heads’, painted by Arcimboldo: virtuoso works executed with the skill of a miniaturist, and one possessed of a detailed scientific knowledge of flora and fauna. The artist created these two heads and busts from flowers, small animals and other natural elements, carefully chosen and relating to the subject depicted, but recognisable only when seen close up. The imagination and ingenuity which characterize the work of Arcimboldo fascinated his contemporaries, but after his death his work fell into obscurity. It was rescued only in the 1930s, when Alfred H. Barr Jr, the founder and first director of the MoMA in New York, championed Arcimboldo as a forerunner of the Surrealists and Dadaists, and showed his work alongside theirs in the celebrated exhibition, Fantastic Art, Dada, Surrealism (1936-37). Since then, art historians and experts have rediscovered Arcimboldo’s highly individual style, elevating him to the rank of one of the greatest of 16th century artists. The Fundación Juan March benefits on this occasion from the special collaboration of Miguel Falomir, Head of the Department of Italian and French Painting (up to 1700) at the Museo Nacional del Prado and author of the principal essay in the catalogue accompanying this exhibition. Lynn Roberts and Paul Mitchell have written the second piece, on the frames of these paintings. Giuseppe Arcimboldo was one of the painters who most embodied the spirit of Mannerism. His art is analogous to architecture in the hands of Michelangelo, one of the earliest exponents of Mannerism: a playful and anarchic take on the classical, which deforms and exaggerates various elements, remaking them in imaginative and inventive ways. 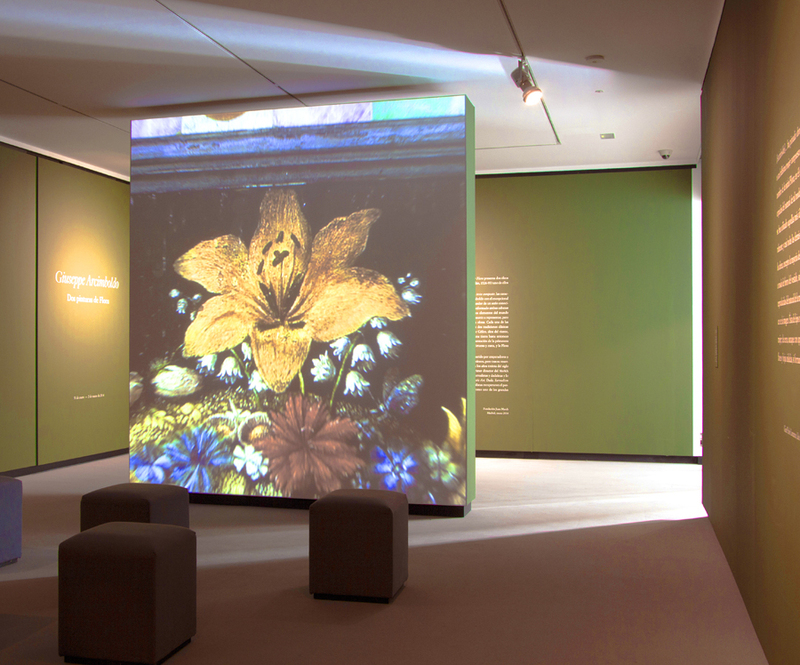 Disparate ornamental works – architectural, carved, metalwork, graphic – from the 1550s and 1560s illustrate the stylistic nexus within which Arcimboldo was working, and indicate how his portraits might originally have been framed. One further important medium from this period which may have influenced the latter question is the technique of pietre dure. This skill was rediscovered during the Renaissance, when inlaid Roman work and mosaics were at first copied and then remade in the taste of contemporary painting. 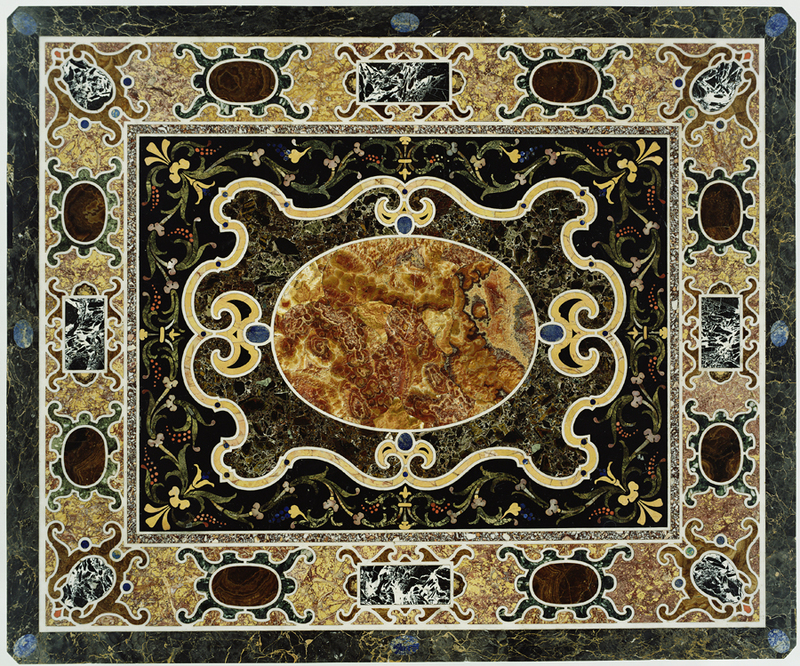 The materials used also diverged from the variegated earth-coloured marbles of classical Roman and Renaissance inlaid work. Pietre dure during the second half of the sixteenth century and the early seventeenth century imitated the Mannerist use of painting pigments by employing harmonies of intensely coloured semi-precious stones, such as agate, amethyst, lapis lazuli, malachite and rock crystal; sheets of transparent alabaster were even laid over prints or drawings to provide a further enrichment. The hugely enlarged palette of tints and tones enabled by this expanded range of stones moved the craft still further away from the abstract patterns of antique pietre dure, so that trompe-l’oeil depictions of flowers, fruit and bands of jewellery were regularly set into the tops of tables or wall panels. These intricate and colourful works of art spawned their own genres of picture frame, based partly on the decorative pietre dure borders of furniture and panelling, partly on integral architectural altarpieces made of differently coloured marbles, and partly on inlaid cabinets, which combined painted panels framed in inlays and columns of semi-precious stones. 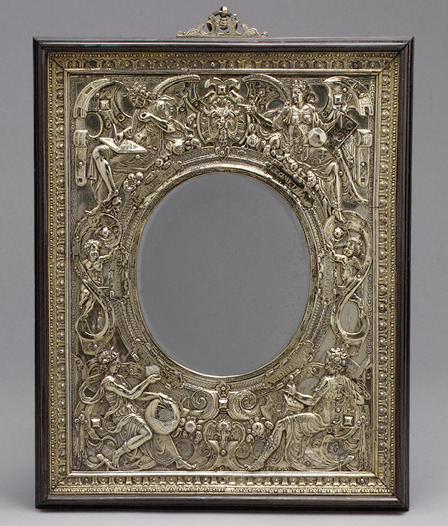 These various influences produced two types of frame: miniature aedicules of inlaid wood, or polychrome faux marble; and cassetta frames, their friezes inlaid with shaped panels and cartouches of stone. Both were fashionable from the mid-sixteenth century until well into the seventeenth, becoming ever more intricate and jewel-like. While Arcimboldo’s surreal portraits would not have been framed in an aedicule, they may possibly have been set in the cassetta versions of these inlaid stone and faux stone frames. The art historian Federico Zeri, who is credited with designing the pair of distinctive pietre dure frames on the present portraits by Arcimboldo. 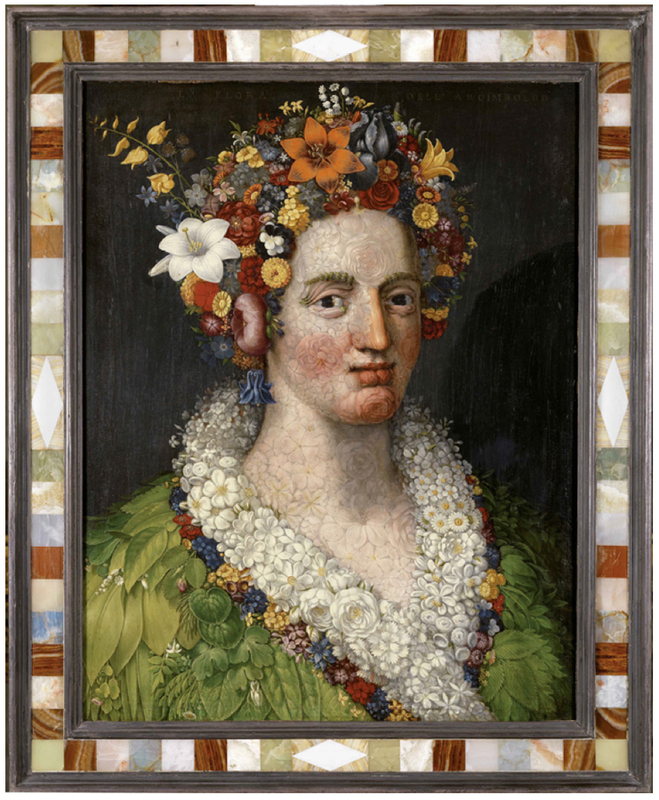 In the face of these disparate solutions to the problem of framing Arcimboldo, Zeri has thought laterally and produced a very individual design, based on the pietre dure frames of a Kunstkammer, in which the colour harmony of the stones echoes those of each respective painting. With their grey “ebonised” mouldings, the frames are wide enough to provide a definitive boundary around the pictures; their colouring is light and playful, in the spirit of the flowers of which the portraits are composed; they emphasise the supremely decorative aspect of the artist’s work; and they have enough historical authenticity to stand as a very acceptable answer to an otherwise insoluble problem. Thank you – how kind of you to post this! – I wasn’t aware that the catalogue had been put on line, so am grateful for the alert, and for the link.